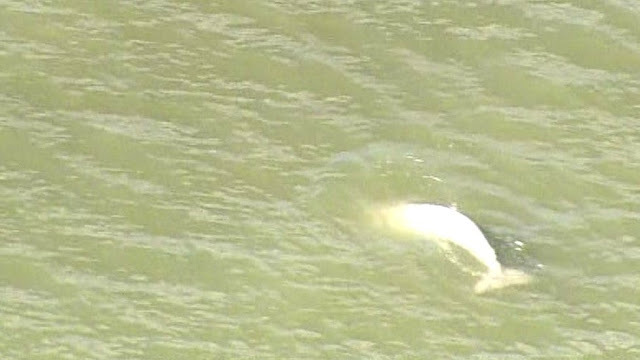 It's thousands of mile from home, it lives in the cold waters of the Arctic and Greenland but yesterday a beluga whale was spotted heading towards London in the River Thames. Beluga whales can grow up to 20ft in length and are usually at home in the icy waters around Greenland, Svalbard or the Barents Sea, so why it's so far south in the warm September waters of the UK is a mystery. According to the BBC, it was first spotted by ecologist and ornithologist Dave Andrews on Tuesday, who said it had been feeding around barges near Gravesend in Kent. Rescue teams are on standby in case the whale, which usually lives in the Arctic, gets into danger. Conservationists are waiting to see if the "very lost" beluga whale in the River Thames has headed back out to sea. Ships in the river were being urged to keep clear and the public was asked not to take to the water to watch it. Julia Cable, the national coordinator for the British Divers Marine Life Rescue, said: "It's possible that it lost its way after a navigational error, that it has taken a wrong turn. We haven't got an idea about the health of the animal. "These animals can navigate in shallow coastal water so hopefully it will swim away." She said any noise in the water could impair its sophisticated sonar navigation system.